How Can You Test Drive a Car For More Than Just a Few Minutes? As Jalopnik’s resident car buying expert and professional car shopper, I get emails. Lots of emails. I’ve decided to pick a few questions and try to help out. This week we are discussing extended test drives, spotting online scammers, and the best car for a tall teenager. First up: What if you want to test drive a car and really try it out, but the dealer only lets you do so for a short period of time? My wife is handicapped and has some difficulty getting in and out of cars. Sometimes, it’s not immediately evident how a car’s door sill or passenger-side floor pan will affect her for a few days after she’s banged her ankles or shins on the door sill while hoisting herself up and into the seat or while shifting her weight to get back out. 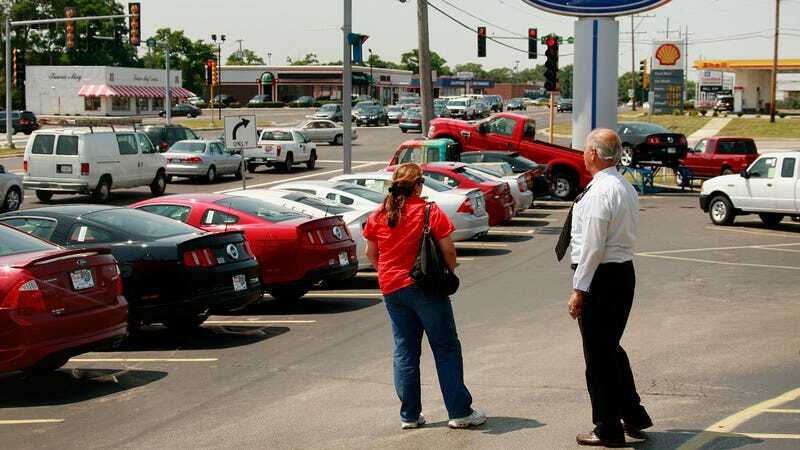 For most car buyers the actual test drive is the least important part of the process. You would be surprised how many people have made their decision on what to buy our lease before they even get behind the wheel. That’s not a method I recommend, but it’s not uncommon. However, in a scenario where the buyers really need to see if the car works for their situation and they can’t come to that conclusion with a quick spin around the block, the are options. Some dealers will let you do extended test drives of brand new cars, but this is typically only for a day or a weekend at most. If you need to try out something longer, ask the dealer if they would be willing to do a rental agreement on a used model. As long as that pre-owned car is of the same generation as the new one it should provide a similar experience. Keep in mind: you are just looking to see if a car fits fine. You don’t need to try out the exact trim and options you may end up buying. In the case of the RAV4 Hybrid, this person may not be able to find a used hybrid model for rent, but a gas-only car is going to be pretty much the same. The other option is to check your local rental agencies, but their fleets are usually limited as you said. Your local Turo fleet may have examples of some of the cars you are considering. A final option, though not ideal, is to look into used car dealers like CarMax, Vroom, and Carvana that have return policies. You could buy a car, and if it doesn’t work out in a few days they will just take it back. Though constantly making then unwinding car deals would be a bit of a hassle. Next up, what should you do when you put a car up for sale and immediately get hits that seem a bit too good to be true? I have a question about selling my car and was wondering if you could help. It’s an I am simply a private seller in Ohio and listed my car on Facebook Marketplace and through a free Cars.com add. I figured I would get some scam contacts, but I just don’t know what is real or not. Since posting add last night, 2 people have reached out after looking at only 5 pictures and are trying to transfer asking price $ to Paypal and send a courier to test drive and pick up already. I have read in your articles about courier / title services for out of state purchases, but I just don’t know how to interpret on the other side. I don’t think these are legitimate since they do not care to ask any additional questions about the car and clearly cannot look at the car in person or drive it. The unfortunate part about online listings is the scammers. Your gut instinct is absolutely right: If a potential buyer doesn’t really ask any questions about the car, it’s probably a scam. A serious buyer is usually out to be sure they aren’t buying something that is going to be a problem. They are going to want to see more pictures, likely ask for service records, and maybe even ask to have the car inspected. And finally, what’s the best car for a tall teen that isn’t a giant truck or SUV? I’m working with a student who turns 16 yrs old in approximately a week. He’s excited to start on his driving permit. However, there is a catch. He’s 6’7”, 205lbs (on the leaner side) and may not be done growing yet. Fortunately, his parents don’t want to put a brand new driver in charge of a tank, so large vehicles (trucks large suvs) are out. Are there any brands or models you’d recommend based on ergonomics complementary to taller folks? Finding cars for larger folks can be tricky, and I applaud this kid’s parents for trying to avoid a large truck or SUV as the dynamics of those cars aren’t ideal for younger drivers. The good news is there are some decent sedans that could work. I don’t know what your budget is but the Hyundai Sonata has won a few accolades as a great car for tall drivers. I had a customer who was around 6’4” and he fits just fine. Tall people may want to check out some of the larger sedans, like a Chevrolet Impala. Another option is a small car but with a higher roof. The Kia Soul is a great car for kids as it’s small, safe and fuel-efficient, but the tall roofline is good for taller drivers. You might also want to consider a compact van like a Ford Transit. Have your young man test drive a bunch of things to see what fits best.